When my Argentinian in-laws first introduced me to this drink, I did not like it at all. It was much too bitter and I didn't like the idea of everyone sharing one straw. After working with them for several years and seeing them drink it all day, I did try it again and again. One day I finally took a liking to it. My sisters-in-law add a little sweet and low to the carafe of water that is poured in the mate or add an orange peel to the mate itself. My husband likes it plain and bitter. It is supposed to be good for weight loss, although all the baked goods I have been making lately and bringing to the office kind of cancel that out. It does have caffeine, so at least it keeps me going all day. 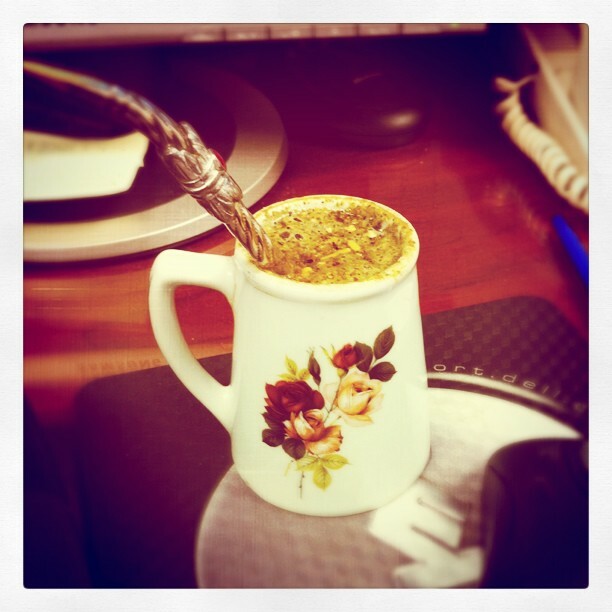 Yerba Mate is kind of like a tea. The leaves come from a small tree or shrub. The ground up leaves are placed in a vessel called a mate. There are different kinds of vessels. I have one that is a hollowed out gourd, another that is wood on the inside and silver on the outside, another that is all glass. This one that we use at the office is porcelain. The water is heated up, but not to a boiling point. Then the water is poured over the mate leaves. You drink from the mate with a straw called a bombilla. It has a filter at the bottom to strain out any bits of leaves and it is usually made of silver. Once one person drinks from the mate the water is then refilled and passed onto the next person. Argentinians are pretty serious about their mate, the bring it everywhere, even to the beach. When I went to Buenos Aires last year I saw people on the street carrying thermoses and their mate, drinking as they walked. It's almost like a drug. I am used to drinking now and drink it everyday at the office. It is supposed to have a lot of health benefits. And it does go well with sweets!